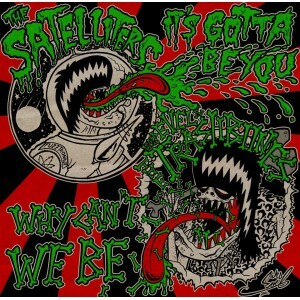 The Satelliters "It's Gotta Be You" / Wild Evel and The Trashbones "Why Can't We Be"Split 7 - PERFECT riff-oriented fuzz guitar / farfisa organ '60s garage meets '80s garage such as The Morlocks, The Creeps, The Gruesomes. HIGHLY RECCOMENDED if you love this sort of music! Released on Decoy Industry Records – DI-6. THICK vinyl - Hand numbered edition of 222, both tracks produced and recorded at IronBar Studios - Darmstad, Germany - Wyld cover art by Wild Evil.